Gold plating is a method of depositing a thin layer of gold onto the surface of another metal, by chemical or electrochemical means. This article covers methods used in the modern electronics industry, more traditional methods, often used for much larger objects, are covered in gilding. Gold plated tungsten bar is one of those items that you really don't realize you need until you have one. Now the executive can keep those papers in place or mark special piles in style. 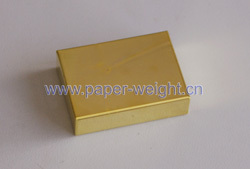 Gold plated tungsten bar can be engraved or imprinted with company logo. 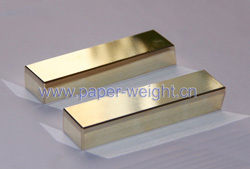 If there is any other interest in gold plated tungsten bar, please feel free to contact us.